At the beginning of the twentieth century, steam was the main source of mechanical power. However, as electricity became more controllable, many small “powerhouses” that produced steam realized they could also produce and use electricity, and they adapted their systems to cogenerate both steam and electricity. Then from 1940–1970, the concept developed of a centralized electric utility that delivered power to the surrounding area. Large utility companies quickly became reliable, relatively inexpensive sources of electricity, so the small powerhouses stopped cogenerating and bought their electricity from the utilities. During the late 1960s and early 1970s, interest in cogeneration began to revive, and by the late 1970s, the need to conserve energy resources became clear. 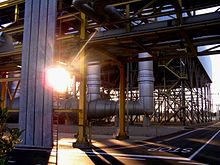 In the United States, legislation was passed to encourage the development of cogeneration facilities. Specifically, the Public Utilities Regulatory Policies Act (PURPA) of 1978 encouraged this technology by allowing cogenerators to connect with the utility network to purchase and sell electricity. PURPA allowed cogenerators to buy electricity from utility companies at fair prices, in times of shortfall, while also allowing them to sell their electricity based on the cost the utility would have paid to produce that power, the so-called “avoided the cost.” These conditions have encouraged a rapid increase in cogeneration capacity in the United States. 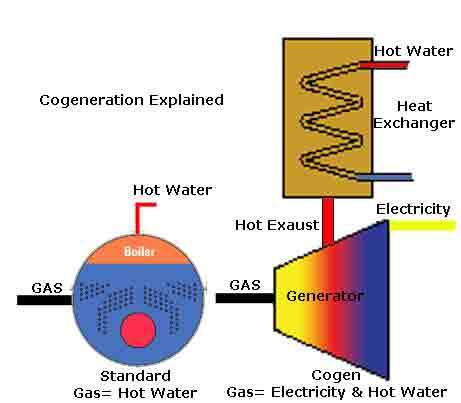 First appearances of cogeneration were found to be in Europe in the late 1880s and in the USA I earlier 20th century. When most of the industries were using boiler (burning coal) and steam turbine to produce electricity. Exhaust stem was being used for industrial processes by numerous plants. Later revolution in the electrical sectors occurred and lower plants at central level were installed with the much reliable utility grid. Industries found better to purchase this electricity because of its decreased cost and stopped generating of their own. So the declined cogeneration. In 1973 there was a sudden rise in the cost of fuel which fueled the cogeneration again. Owing to the higher prices and uncertainty of supply cogeneration came into the picture as a better option due to its low fuel consumption and less emission of pollutant. So Europe, USA, South East Asia and Japan started showing their interest positively in cogeneration. The recent revision of Indian electricity regulatory rules near about 710MW local power generations by use of cogeneration scheme in the sugar industry. other core industries are also moving to be self-sufficient generating their own electricity as well as heat. 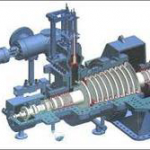 A typical fossil-fuel power plant has an average thermal-to-power efficiency of 35–45% because its steam turbine can only extract so much electrical energy from high-pressure steam and because the low-pressure steam that exits the turbine cannot be used. 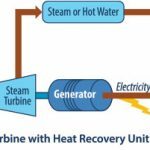 Therefore, the steam exiting the turbine must be condensed, and its potential energy is lost. Industrial plants, however, have a competitive advantage over power plants because they have several process units that can use the lower-pressure outlet steam, which eliminates the need for inefficient steam condensing. In a cogeneration system, steam that passes through the turbines is maintained at an outlet pressure high enough to be used by process units. Because energy at the turbine outlet is re-used, cogeneration systems have overall efficiencies that can be higher than 85%, which allows industrial plants to generate electrical power at lower-than-market costs.